A few details have come out about the next lot of Metro train timetables, and there’s some big changes for some lines, as the process of completely re-writing them continues. Here is a summary based on some notes I saw the other day, and my initial thoughts. My assumption is these notes apply on weekdays only. If there are queries, leave a comment, but note that the full timetables have not yet been made available, and any incorrect information here is probably caused by my misinterpretation as I summarised. Hmm, perhaps there really is no end in sight to the Siemens brake issue, which means speed restrictions approaching stations with a level crossing. I’m also told the Comeng trains can’t keep up with the timetable in peak hours due to heavy loads. Maybe us passengers need to go on diets. Big changes to (most of) the Northern Group will wait for Sunbury electrification (expected 2012). Changes for Clifton Hill will wait for South Morang (expected late 2012). Fair enough, that makes sense, particularly as South Morang includes a bunch of other upgrades to make both Clifton Hill lines run better. Extending the peak pattern makes sense. At the moment they have this neat pattern which (to the observer) appears quite efficient and consistent, but varies and disappears during the peak shoulder period. Off-peak all running direct to Flinders St — well, people will need to get used to that, but at least the confusing half-and-half pattern now will be made more consistent. It would help if the Dandenong line was a matching 10-minute frequency, so plenty of loop trains were available, but the notes don’t say if that’s happening. Which I’m guessing means it’s not. Werribee – complete re-write of the timetable. Trains from Werribee every 11 mins in peak, running direct Laverton to Newport (allowing 3 more trains in peak). Laverton to City via Altona Loop trains every 22 mins in peak. Williamstown to City every 22 mins in peak. Aye carumba! Re-write for consistency is good. More frequent trains from Werribee is good (the current 4-20 minute gaps are bound to lead to overcrowding on some trains), and all running via the direct line is good. But trains for Altona/Westona and Williamstown every 22 minutes in peak? Seriously? A long wait between trains, and how’s anybody meant to remember that timetable? Is that the best they could do, after spending $92.6 million on the Laverton rail upgrade? Obviously it’s linked to the Werribee trains running every 11 minutes, but surely they could have tweaked/upgraded the signalling to make it an even 20/10 minutes. OK. The Altona/Westona people aren’t going to like it, but it does make sense for their trains to be the shuttles instead of Williamstown, because Williamstown has double-track, so delays are less likely to cascade. This also fixes the inconsistent 4-16 minute gaps in off-peak now between Newport and the City. But halving frequencies between Laverton and Werribee? Why on earth did they give them 10ish minute frequencies in 2009, if only to take them away again? And what happened to the idea of the whole network having frequent services all day? I know operationally it’s a little difficult at Newport, but I suppose I’m surprised they’re back-pedalling on this. Alamein to run to City Loop in AM; direct from FSS in PM. Implied to be some extra off-peak services (into city), but not certain. Glen Waverley to run direct to FSS in AM; around loop in PM. Frequency upgraded to average 7.5 mins. I’m told it’s apparently being done to get around issues with Metrol, involving the handover between two controllers as trains move between sectors, which can cause delays. Another case of a weakness in the infrastructure? So why are they doing all this? To better fit the extra services possible with the bigger fleet, and even out loads, and improve reliability. All admirable goals. The question will be whether or not it works. And the complexity for passengers — some dealing with odd frequencies like every 22 minutes, and some will need to change trains on the way to work but not the way home, or vice versa — surely will lead to some confusion. As a non regular train passenger, I would like to know what regular train passengers think of all this? The http://www.theage.com.au/ poll is split 50/50 at time of posting. Handover of trains between controllers? So they seriously have humans watching every train and passing control of them between each other? No wonder there are inexplicable stoppages at apparently random times. Why do we not have a fully automated signalling system with each train communicating with any others nearby to ensure there aren’t any collisions? I believe it is a very bad move for Metro! First, they will make people who rely on the Altona Loop (Seaholme/Altona/Westona) wait a massive 22 minutes for a train at peak time! Then, the City Loop will be confusing to many who rely on the Burnley lines since they’ll install odd Loop patterns (Loop to Flinders Street in the morning, but direct to Richmond in the afternoon). This means that mostly the Belgrave and Lilydale Lines will only run via the City Loop, but with a few exceptions that you made above. This will add travel time to many, so I think Metro should not make the changes a reality. Alamein through the loop in the AM? Suddenly I feel the pain of all those people who’s loop trains were ripped out from under them, but in reverse. So is it going to be possible for me to change to a FSS direct train at Richmond? I’m guessing I’d need to change to a Glen Waverley Train? Or, I could just get off at Parliament and walk/Tram to work. Then I get to use the myki gates (assuming myki is still with us in may LOL). What’s the bit of line coming off from Elsternwick?! I think the govt should just let metro do it’s job. These changes are a small part of the larger picture. metro has the modelling, the govt doesn’t…they won’t understand ie too many cooks spoil the broth. I beleive metro are trying to do what’s best for the trains and i am prepared to wait and see. First they need to improve delivery, which they are improving, and they need to improve punctiality which they are also. both i give ticks to metro. Remember, they are trying to run a service on 2nd rate infrastructure. With their process of rolling maintenance (see http://www.youtube.com/watch?v=b4fCCzNiUgU), and their vision of what a train service should be like, I think we’re in good hands. Question: how many late trains are due to slow passengers rushing to get to the front carraige? There should be a time limit on how long a train should stop to pick up/drop off passengers if there isn’t one already. I guess that’s the problem of a loop. You have to enter it somewhere and won’t suit all passengers. You could argue why can’t they alternate, but that is the problem in the first place. The congestion in the loop is horrific and having the loop move in one direction would stop that congestion and manageable. Williamstown 22 mins is the one that affects me. I board/stop South Kensington and I can work with (but am not happy about) 22 mins trains when they are running on schedule but a cancellation means 44 mins between trains, that’s getting to the point of not being usable due to lack of a reliable service. If the occasional Werribee would not run express it would be more workable. In the mornings I often see them wiz past looking nowhere near full. Mondays are particularly bad for my schedule as I need to pickup my son from childcare by 6pm and despite arriving at Flinders street at 5pm there were a couple of very close call during 2010. That also reminds me that the announcers at Flinder Street would do well to try to inform commuters of extreme delays so that they have the option to find alternate transport. There is nothing worse that knowing you are late and holding out for the “next train” only to have it canceled or delayed further. When we are talking about 20+ min delays there are many alternatives for people in a rush; other lines/buses/trams/taxi’s. Making the real delay known reduces pressure on the later services too – it benefits everyone. You’d think that living in an inner city suburb your public transport services would be pretty usable, it’s truer in the east but in the west – not so much. Glen Waverley direct and the Ringwood/Blackburn/Box Hill/Alamein stoppers via the loop in the AM makes a great deal of sense to me. If you consider a greatly simplified look at Richmond in the AM peak you typically have FSS direct trains on Platform 7, and loop trains on Platform 8. This means that the Glen Waverely line needs to cross the R/B/BH stoppers prior to Richmond. As the GLW line also stops at East Richmond this often means a wait at the platform there for the through lines to clear. Swapping them means the Glen Waverley can run direct into Platform 7 from East Richmond, and the R/B/BH/A AM trains can stay on the through tracks into Platform 8. As a Glen Waverley line passenger, this doesn’t mean much change for me anyway. It will make my wife happy as she no longer has to change at Richmond for a direct FSS service, but it means I’ll need to change for a loop. She’s managed it for the last 12 months so I’m sure i can handle it too. On thinking about it (and sorry to spam up your comments Daniel), it’s really not that bad, at least for me. I’ve been travelling into the city from Hawthorn to FSS for almost 9 years now. I can still change at Richmond and do that if I want to (and hopefully these changes will mean less waiting in the yards between Richmond and FSS?). Or I can just go into the loop and exit at Melb Central or Parliament, and it’s less than a ten minute walk to work. I assume the loop won’t be any busier or less busy than before because Glen Waverley Trains have switched with Alamein trains and vice versa. Trains from Blackburn and Ringwood would also appear to be going through the loop. @Roger, currently some Sandringham trains link through to Southern Cross and the Williamstown/Werribee lines. @Philip, apparently. Sounds archaic, doesn’t it. @Konrad, the tea towel maker used a bit of artistic licence. @Adrian, it’s not clear yet if some Werribee (or more likely, Laverton/Altona Loop) trains will stop at South Kensington (as well as Spotswood etc); if so you’d get an 11 min service. Hopefully the full timetables will be out soon. @bok, yeah that makes some sense, though it’s not clear to me why it’s not an issue in the PM peak. @Nathan, yeah they seem to be saying all stoppers through Camberwell (eg from Ringwood, Blackburn, Box Hill, Alamein) will run via the loop in the morning peak. Some of your comments in the press make-out that peak-time commuters are stupid, and cant handle varied stopping patterns, express trains, loop trains & direct trains. Your comments seem to imply if the timetable isn’t an exact multiple of 5 minutes, with each train behaving identically, then the poor commuter will suffer. Just to let you know, this is the information age, and people who want to get to their destination efficiently and on time, have plenty of means to find out the best train, and also get updates about any problems. Your comments about 22 minutes frequency are so last century. Please move on to the facebook world. Past Ringwood, they only operate every half hour during off-peak (though strangely, every 20 minutes on weekends). Why such a long wait, yet Frankston line passengers have off-peak services every 10 minutes. Can’t wait until 2012. The Sydenham line is in desperate need of a complete re-write. When you can’t find a seat by the time you get to ginifer citybound and at parliament when running from flinders street through the loop you know something’s wrong (I hear that the craigieburn line timetable is just as antiquated). This is off-peak (2pm weekdays) let alone peak hour. I hope double track shared with vline trains will be enough to bring off peak services to at least every 15 minutes and peak services to at least every 8-10 minutes. Also, frequency on upfield every 10 minutes at least in peak hour would be nice. Not sure if express trains are needed on upfield though. Alisdair – I think you’re right to that to some extent, exact clockface timing isn’t as critical as it used to be. However, public transport serves a broad cross-section of the community and fewer than you might expect are in the ‘facebook world’. Where it’s possible to stick to clockface timetables, every effort should be made to do so – why should I pull out my smartphone (if I even have one) to find out which weird interval my next service is at, if I can just remember ‘exactly every 15 mins’? Further, while say TramTracker provides realtime info, there’s no such service for the trains as yet. So as has been pointed out, if you just miss a train, and there’s a cancellation, on some lines it’s up to 44 mins for the next one… not exactly ideal. Also, I recently experienced a cancellation (first train of the day) – no website updates, no on-station information, zip – so that information isn’t as well transmitted nor accessible (at present) as you’re making out. 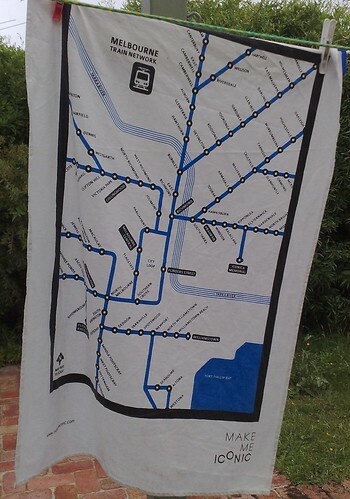 what is that marked near Elsternwick on your towell ? @Adrian etc. : 22 min between trains is not that different to what Upfield line passengers have to deal with all the time anyway :-) (except when it changes to half hourly after 8pm). Yeah, cancellations sometimes “just happen”. And @Jon, no, Upfield doesn’t need expresses. It’s a short line. Yesterday afternoon all the crossings between Hope St and Coburg were jammed shut for a while. Traffic chaos! @Alasdair, if you don’t have frequent service (say every 10 mins or better) then people want to know the timetable. The easier you can make it for them to remember, the better. @X, nothing announced yet, but the full detail is not yet out. So will they bring back the old red rattler shuttle we had in the 1970s on the Altona line (as it was back then)? What did we do to deserve treatment like this? I can just see it now – they cancel one of our trains during peak hour then the next one is late and before you know it an hour has gone by without getting too far. I actually bought a new car and drive to work 4 days a week because I couldn’t stand the cancellations and delays any more. So to think this through for a moment, as a Williamstowner, I can now get an off-peak train more frequently than i can get a peak train? The Frankston line bit up top gets more hilarious the more I think about it. I’m totally shattered that off-peak frequencies on the Werribee line will be cut back to 20 mins from the 8/12 min frequency upgrade only a year ago. Is this honestly the best a growing city like Melbourne can do even as the population exceeds 4 million? I thought we were supposed to be moving towards 10 min frequencies on all lines, not cutting back on services. It’s enough to make you just wanna pack it in and go out and splurge on the biggest SUV available. Didn’t take the shiny, new Coalition government very long to show its true colours, did it. “Fix public transport…” yea, and pigs really do fly. @DJM, you’re not the only one though. It’s been like that on the Alamein line for years, as well as the outer ends of the Hurstbridge line against the peak flow. @Daniel, it’s certainly a backward step in a number of ways, but remember that these timetables take months and months to plan and develop. Don’t be under the illusion that Labor wouldn’t have approved exactly the same changes had they been returned to government in November. nothing for upfield, yet again, and i won’t be counting on anything post sunbury in 2012 what can one do ? @Tim, obviously the full details aren’t out yet, but I don’t expect anything for Upfield. All the peak stuff at the moment is trying to cut the overcrowding, and Upfield (provided nothing is cancelled and everything runs as 6-car trains) doesn’t suffer from overcrowding to anywhere near the levels of the busier lines. I know I’m a bit late here, but I was on leave when all this hooha broke out. I work closest to Southern Cross station and am forced to change trains every morning and night at either Footscray, North Melbourne or Flagstaff to catch a Sydenham/Watergardens train (which only run every 20 minutes or so even in peak times if you need the stopping all stations service). Otherwise we are forced to go all the way around the loop – and then wait at Flinders Street for the train to commence its ‘new service’ – adding around 20 minutes to the commute time. Often at night this means having to leave a number of trains go past because they are too packed to even get on by the time they reach Flagstaff. A very large number of other commuters do this with me every morning and night and would definitely welcome a few trains that ran direct through to Flinders Street from the Sydenham side of town. I’m also with @Dave – I’d welcome if all lines ran the same way around the loop all day – so you get the benefit at one end of the day and have the shuffle at the other – The Clifton Hill loop lines do this already and I think it’s a great idea so everyone shares a little inconvenience, rather than there being winners and losers! I think people complaining about having to change trains just once a day, when they are blessed with a service every 7.5 minutes should try out some of the less blessed stations on the network and see just how good they’ve got it – I’m dead certain they’d start raving about their service after that. Metro Trains and The Baillieu government. How clever they are with their problem solving. Their solution to improving train services is to eliminate the problem children. The Seaholme, Altona and Westona services are to be sacrificed because those trains were only on time 78% of the time and Metro trains get fined for lack of punctuality. Let’s NOT improve the punctuality and service on those lines. The way to fix it is to take away the service. No more fines for Metro Trains. Yay! I am flabbergasted that they’re going to actually reduce public transport services in the West and call it a solution. Such a regressive, arrogant move. 1. The two minutes more (20-22 mins) doesn’t sound much but it means that every tenth train that is running now, will not be running at all. 2. I live in Seaholme and Newport (the next station) is hardly ever my final destination. Usually I am going to the city and beyond or to a station on the loop. I can do that now on ONE train. With the new timetables it will involve THREE trains. 3. Pulling all Newport lines completely from the city loop disadvantages ALL travelers on these lines who wish/need to access the city loop. 4. I recently bought a house in Seaholme, close to the station, so my disabled daughter could access close, safe, ‘reliable’ public transport as she will never drive. She is supposed to be starting a course at Footscray – one train, 5 stations. She would now have to take TWO trains to go 5 stations. The first is from Seaholme to Newport – ONE STATION – then change trains. She will be unable to negotiate that and her proposed independence and community access will be lost or severely compromised.